I had chicken in the freezer and not a clue what to make for dinner. I needed to run to the store on my lunch break today so I decided to make some Lo Mein. Now I took a chance with the vegetable thing but they can also pick it out. I’m a fan of any kind of vegetable so I love what I added to this. I know my family doesn’t like carrots or broccoli but most mixed bags of vegetables have both of those in them. I LOVE the little baby corn! I saw this in the frozen section and knew that was going in the Lo Mein!! I have a little one that I have to pick up from daycare every day. When she gets home, she wants to eat. And if the food isn’t done, she is following me all over the place! So I got dinner started on my last work break today (I have the pleasure of working from home)! I baked the chicken instead of frying it in a pan. Once it was done I put it on the microwave to sit for a bit. Once I was done with work I added the ingredients to a big skillet and covered it until I got the kids all home. Heat oven to 400 degrees. Place chicken breasts on a flat cookie sheet and bake until cooked through (about 25 minutes). Put the chicken in a large skillet and add the remaining ingredients. Heat to boiling. Reduce heat and partially cover. Simmer 12-15 minutes, stirring occasionally, until pasta is tender. As you can see Mr. Clyde likes this meal too!! Home made dinner is better to me than any take out meal. Ok, unless you count my Sunday lunch at Zantigo! What to have for dinner. What to plan for the week. I tend to go through this as you already know every single week. I want to try new things, I want to make sure the family will like it, and I also want to find something that is simple to make, yet has great flavor to it. I love Pinterest because I’ve found many good recipes on there. I also have found quite a few recipes that are healthy for you (you may get sick of that but it’s what we have to do in our house) on the Kraft foods website. I found this Updated Shepherd’s Pie on that site. At first the family was a bit skeptical when they saw what I was putting in a pan and then on top of it!! (And yes we’ve had this before). COOK potatoes and garlic in boiling water in large saucepan 20 min. or until potatoes are tender. Meanwhile, brown meat in large nonstick skillet. Stir in flour; cook 1 min. Add mixed vegetables, broth and ketchup; cook 5 min., stirring frequently. 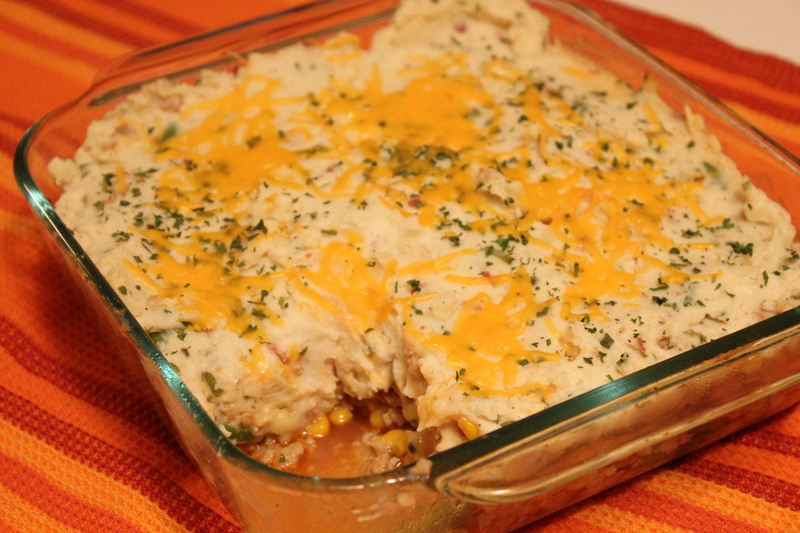 SPOON meat mixture into 8-inch square baking dish; cover with potatoes. BAKE 18 min. Top with remaining cheese; bake 2 min. or until melted. We took a classic recipe and gave it a makeover by replacing the butter in the mashed potatoes with both BREAKSTONE’S Reduced Fat or KNUDSEN Light Sour Cream and KRAFT 2% Milk Shredded Cheddar for great taste and a creamy texture. In addition, we used extra-lean ground beef in place of regular ground beef. These small changes resulted in a savings of 90 calories and 15g of fat per serving. Substitute 1 cup BREAKSTONE’S or KNUDSEN Low Fat Cottage Cheese for the sour cream. Blend the cottage cheese in a blender until smooth before using as directed. Prepare using your favorite mix of frozen vegetables. Another hearty, comfort food dinner. This was a big hit. No left overs tonight!! I know, Patricia, I was supposed to be making a pot pie. But this was easier and just sounded good! I’ll make the pot pie another night. Promise. I mix this in the 13X9 baking dish so I don’t have to wash extra dishes. First add the frozen veggies, the potato/onion and ham. Then pour the alfredo and ranch evenly over the top. Mix well. Combine the crushed crackers and melted margarine in a small bowl. Sprinkle over the top of the casserole. Bake at 350 for about 40-45 min (should be bubbly and golden brown). I even got Scott to eat it and he doesn’t much care for ham. He enjoyed it, and has volunteered to help eat the leftovers.